Teach Him to Recognize Quality Clothing! That first suit buying experience for a special occasion is an exciting time for the entire family. Why not turn in into a learning experience by taking him to a real men's clothing store like Charney's? Not only is Charney's family owned and operated, our clothing professionals take the time to create an educational family shopping experience, one that he will remember for a long time to come. Charney's has an extensive collection of boy's and young men's suits and blazers in from sizes 8 to 22 in regular and husky sizes. 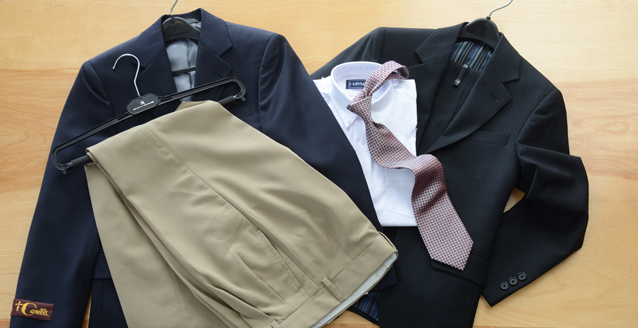 We also carry boy's dress shirts, dress slacks and ties and will show him how to coordinate his first dress outfit! We're happy to answer any questions you may have about our boys's suit department. Please call us anytime during store hours at 315-463-6011. Thank you for supporting your local family clothier in Syracuse, Charney's Men's Clothing Stores.